There is a growing body of evidence that postgraduate students experience higher rates of depression and anxiety than the general population. Edith Cowan University is trialling an innovative solution, connecting postgraduate students through combined peer mentoring and writing program called Write Smarter: Feel Better. “We know that the factors which impact on mental health wellbeing are incredibly complex. ECU offers a range of fantastic support services for students at all levels, but we also realise that postgraduate students face some unique pressures,” said Associate Professor Simon Laws from ECU’s School of Medical and Health Sciences which will host the trial. Developed by the Cooperative Research Centre (CRC) for Mental Health, Write Smarter: Feel Better is peer-led so that students can discuss issues of direct relevance to them. All student facilitators in the program are graduates of mental health first aid training and have regular interactions with university staff. The program will be trialled in ECU’s School of Medical and Health Sciences with the support of a Teaching and Learning Grant. Following evaluation of the trial, a wider roll-out may take place in 2019. Sabine Bird, facilitator of the program and a recent PhD graduate, said her involvement in Write Smarter: Feel Better during the CRC for Mental Health pilot has had lasting benefits. “Attending monthly sessions with other PhD students meant that we could talk about our frustrations or successes in a space where we knew we were all going through similar experiences. It was fun catching up with other people and I always learned something,” said Sabine. ECU provides a number of free services to all currently enrolled students including the Student Health Service, Equity Diversity and Disability Service, Student Connect and Learning Consultants. 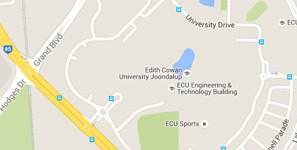 The ECU counselling service provides free, confidential support.